Need a Desk under a Metal Loft Bed? Is your teen or tween looking for a lofted bed with study area below? 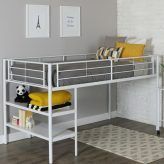 Consider one of our metal loft beds with desks. A study loft is just what your tween or teen will love. It optimizes room space while leaving plenty of room for hanging out with friends. A loft bed with desk underneath gives ample space for doing homework, creating art projects or surfing the internet. Add your favorite funky desk chair to show your unique style. The rest of the room is open for additional storage or whatever you choose to do with it. 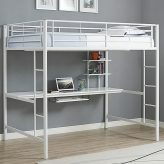 We have a silver metal loft bed as well as powder coated white and black metal framed loft beds. 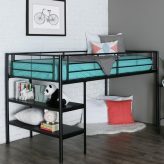 The twin loft bed with desk supports weights up to 250 lbs making it double for adult loft beds. 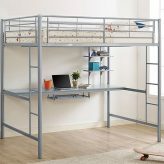 Not only is this the ideal teen loft bed, it would be great in a dorm room or studio apartment.